NeMe with the Visual Sociology and Museum Studies Lab and the Department of Communication and Internet Studies of the Cyprus University of Technology are launching this open call for participants from the arts, design, hacking, architecture, anthropology, technology, philosophy, and other disciplines. 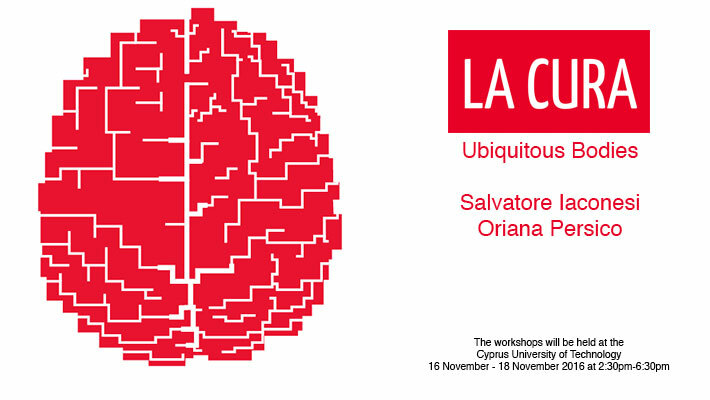 The workshops, La Cura: Ubiquitous Bodies will be led by Salvatore Iaconesi and Oriana Persico. The results from the workshops will be included in the exhibition nEUROsis at the NeMe Arts Centre (19/11/2016-18/12/2016) and a PoD publication by the Leonardo Electronic Almanac. Those interested should call on 25 372675 to reserve a place by 12 November 2016. The workshops will be in English and participation is free of charge. Sciences and technology have enormous effects on the ways in which we perceive our body, our interconnectedness with the rest of the world – whether human or non-human -, our health and well-being. La Cura is an open, participatory performance whose aim is to create a social space which links technologies and networks, but also proximity, solidarity and human relations. He currently teaches Interaction Design and cross-media practices at the Faculty of Architecture of the “La Sapienza” University of Rome, at ISIA Design Florence, at the Rome University of Fine Arts and at the IED Design institute. He produced videogames, artificial intelligences, expert systems dedicated to business and scientific research, entertainment systems, mobile ecosystems, interactive architectures, cross-medial publications, augmented reality systems, and experiences and applications dedicated to providing products, services and practices to human beings all over the world, enabled by technologies, networks and new metaphors of interactions, across cultures and languages. His artworks and performances have been featured worldwide at festivals and conferences.